When people think of synchronized sports, they normally think swimming. But imagine if the pool was frozen. Where would that leave you? Kaitlyn Syrowsky has the answer–synchronized ice skating. Woodland Junior, Hawk Headlines’ business manager and synchronized ice skater, Syrowsky, has been back and forth from school and the ice since childhood. What the Star Catchers, a synchronized ice skating team out of Shelton, does is much different from what everyday people what during the Olympics. “It’s more not really highlighting one person. We all have to be the together,” states Syrowsky. Together is putting it simply. Synchronized skating requires copious amounts of trust in your teammates, and that is no easy feat. Syrowsky’s team participates in team-building activities outside of the rink, most of these activities planned by her mom, the Team Mom. “This year, we were really close. We had a lot of team bonding. We went bowling this year; we did an escape room. It’s fun,” says Syrowsky. These team bonding activities helps build connections between the teammates. Unlike other team sports, if a synchronized skating team does not trust each other, there could be disastrous results. Synchronized skating is an uncommon sport, which gives Syrowsky her own unique hobby that no one can take away from her. “It’s kind of my own little thing,” says Syrowsky. Because the sport is so uncommon, many of Syrowsky’s teammates live a long distance away. Their dedication is shown through the willingness to drive hours every week just to practice. Synchronized skating is not currently an Olympic sport, which is a huge issue facing the synchronized skating community. The Olympics are an event to help people of all different countries come together and bond through sports, so synchronized skating not being recognized as an Olympic sport is an issue. “We [the synchronized skating community] want it to be an Olympic sport. It’s hopefully coming up in 2022. But right now, it’s just pairs and stuff like that in the Olympics,” says Syrowsky. Even though synchronized skating is not an Olympic sport, there are still large competitions, such as the World Championships. For the Star Catchers, Eastern Sectionals are their largest competition. “This is what we always practice for throughout the year at other competitions. So last year, we went to Florida. This year, we went to Worcester, Massachusetts,” explains Syrowsky. Syrowsky works hard to balance skating with keeping up in her honors classes, and active participation in Hawk Headlines and Global Scholars. Syrowsky is challenged sometimes due to having numerous practices a week. 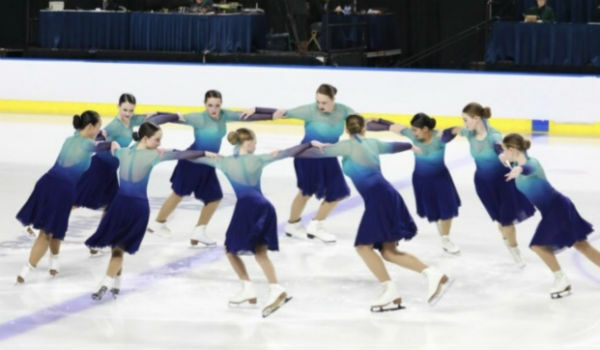 Besides all of the challenging time constraints and teamwork skills, synchronized ice skating is also very physically demanding. Syrowsky is often sore from the numerous run-throughs of her routine and endless workouts. “It puts a lot of strain on your knees, on your thighs and everything like that,” Syrowsky states. Workouts on the ice are not enough to keep the Star Catchers on top, they also go to the gym on numerous occasions. Despite all the challenges that come with synchronized ice skating, Syrowsky continues to excel in all aspects of her life and will continue to do so. ← Previous Story Do the Patriots Make the NFL Less Enjoyable?